A small city with a population of some 20.000 located in a farming region in the province of Entre Ríos. The activity is basically commercial. 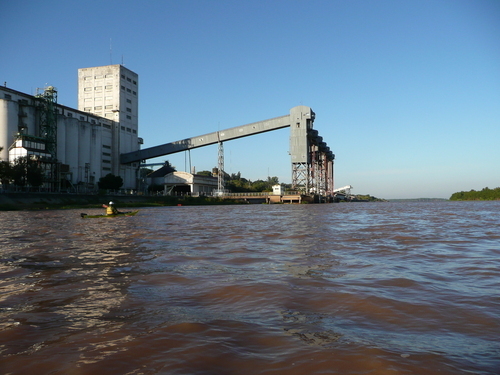 The road network connects the region to Buenos Aires, the whole Mesopotamia, Brazil, Paraguay and Uruguay, and through the Paraná -Santa Fe tunnel and Victoria -Rosario bridge connects it to the Pampa region to the west. 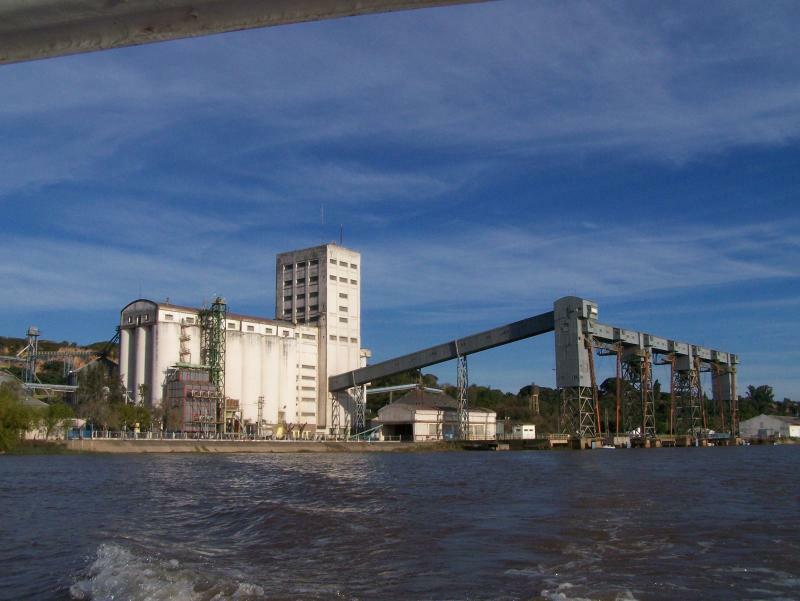 The closest commercial airport is in Paraná (capital of the province), some 50 km away. 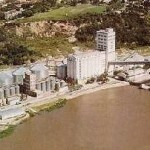 The main interest to shipping is the grain elevator situated in the port. 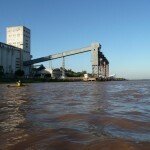 The elevator is owned by Cargill and operates as Puerto Diamante S.A.
At northern end of the port, vessels berth starboard side to quay without tug assistance on 4 dolphins made of reinforced concrete, berthing frontage 156m with outlying head, stern mooring bollards, vessels of up to 257 m have berthed. Cargo transferred from silos to loading gallery by twin inclined conveyor belts. Loading gallery supported on 4 latticed towers and fitted with 7 telescopic loading chutes; outreach about 22 m. Vertical clearance reportedly 21,2 mat datum. Average loadrate 900 TPH (2 belts). Grain storage capacity is 90.000 ton. Reception rate: trucks abt 7300 TPH. Exports includes soybean, corn, wheat, sorghum and rice. Apart from the elevator berth there is an adjacent general cargo whart 150 m length with four warehouses of 7000 sqm covered area, two of which are rented privately. A small 60 meter berth for barges has been constructed to the north of the general cargo wharf. Downriver from port, admitting as per standing regulations 2 Panamax size vessels. Access channel is 1.200 m long, 120 m wide, depth at datum 7,25 m (23 ft). Depth alongside elevator abt. 7,00 m . To foregoing add height of river above datum at any given time, details of which can be obtained from the Boletín Fluvial and should be checked with pilots before proceeding. 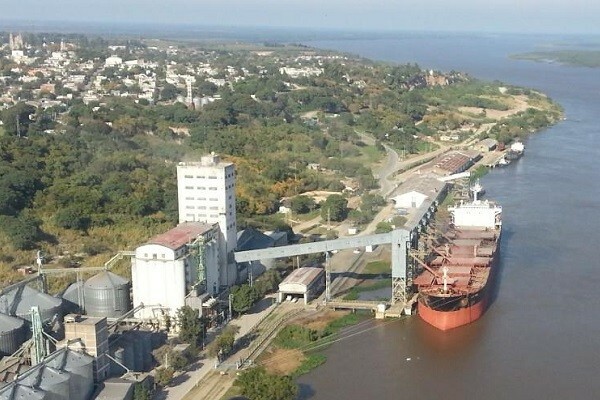 The river between Diamante and San Martín (Santa Fe) has been dredged to give a minimum channel depth of 8,20 m (27 ft), which minimum it should be noted is in relation to an agreed reference level . Early 2012 dredging works were finished restoring to above mentioned drafts at entrance channel and berths. Port pilots discourage night time sailing from port to roads which about 45 minutes steaming time down-river. 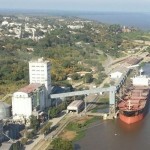 Expected arrival time should be advised to grain elevator operators Puerto Diamante S.A. and Port Authorities at least 5 working days prior arrival. Berthing granted on first come, first served basis providing cargo export documents ready. Traffic and security messages are attended by Prefectura Naval (Coastguard) on VHF channel 12. No local Port Health office. Ships put forward request via cable, telex or fax to Agents, for them to channel same via nearest office at Santa Fe, distant about 74 km. Travelling costs of either Doctor or on-duty Sanitary Officer are on ship´s account. 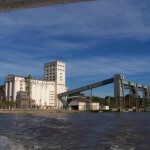 Three private companies stationed at Rosario. Pilots usually travel up to Santa Fe by bus or car and thereon Agent arranges car transport to Diamante. Return trip is performed in similar fashion. Vessels berth bow in without the aid of a tug, however one tug is required on departure for backing out of the berth. Vessels of less than 110 m are normally exempt from the use of a tug on presentation of request for exemption to PNA (Coastguard). One tug is available in the area, must be requested through Agents in advance. Available at provincial hospital or private clinic. One available (1 star category). Otherwise accommodation can be obtained at nearby cities of Paraná or Santa Fe. Intercity, long distance bus services to Paraná and Santa Fe and beyond via highways 11, 32 and 45. Domestic airport at Paraná, distant 40 km with daily flights to Buenos Aires. Withdrawal can be arranged via truck. Available two sheds of 750 and 450 m2 covered area. Elevator administration can offer limited services for cargo spaces. Can be arranged via local Port Administration.